Two weeks ago, IBM was a launch partner with Veeam for the release of Veeam Availability Suite 9.5 Update 4 with support for IBM Cloud Object Storage. This week, Veeam is showcasing our combined solution offerings for Intelligent Data Management with IBM at IBM’s worldwide THINK event in San Francisco. So, what do we expect from this week at IBM Think? For one, it’s all about the data. But not just data and how to deal with the crushing growth of data that all companies struggle with. This event focuses on how you manage data strategically and what you can do with it to drive business. A few years ago, many believed that the cloud’s most common use case for data was backup or disaster recovery. Today, it is the unlockable value of data, and the added agility of that data (enabled by it being in a cloud), and what you can learn from it with artificial intelligence and machine learning. IBM’s extensive IBM Cloud platform, with Watson, is all about helping you build a cloud strategy for your data and applications that helps you migrate and modernize, do more with your data and manage your multi-cloud investment. Don Boulia, IBM Cloud General Manager, told the worldwide Veeam audience on our Veeam Update 4 broadcast that his role was to help as many companies to the cloud as he can, and to make it as quick, easy and painless as possible. One of the IBM-Veeam synergies Don pointed out was Veeam’s role in helping customers move to the cloud, allowing IBM Cloud to deliver the same data protection and resiliency that companies have come to expect from managing on-premises data. 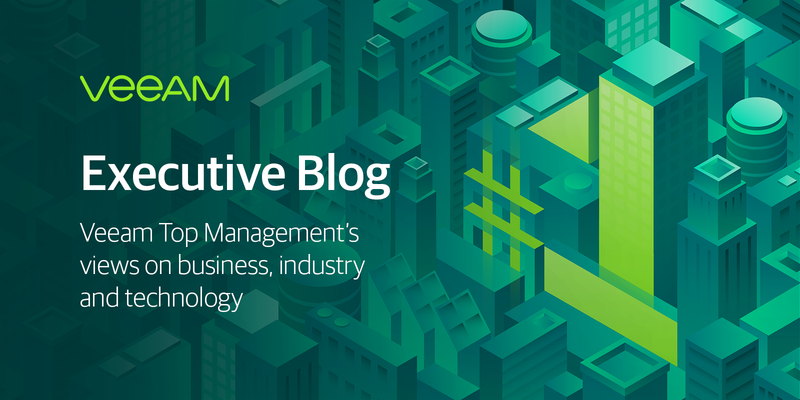 IBM’s broader Global Services organization has been accelerating the business value of IT (and its data) for years, so coupling IBM Cloud and Veeam’s Intelligent Data Management capabilities makes sense. IBM’s Resiliency Services provide the expertise that is the real difference between simply ensuring the recoverability of data and the assurance of continuity of operations during crises. And of course, the data you bring to the cloud becomes more valuable once it is there. IBM Cloud’s artificial intelligence unlocks the value hidden in data, not just mining insights, but actually putting them to work for you with machine learning. The more valuable the data, the more it is worth protecting with Veeam solutions. IBM Think gives Veeam a chance to show what we can do with and for IBM customers in their data center, on IBM Cloud and across a multi-cloud environment. Veeam Availability Suite, which is quickly and easily provisioned directly from the IBM Cloud portal, helps customers migrate to and keep data available in the hybrid cloud regardless of its location. Veeam support for IBM Cloud Object Storage provided efficient tiered strategy efficiently long-term data retention with unlimited scale. Veeam Backup for Microsoft Office 365 on IBM Cloud eliminates the risk of losing access and control over your Office 365 data, allowing you to back up and retain highly-valuable online Exchange, SharePoint and OneDrive for Business data. IBM Global Service offerings provide experts for fully-managed Veeam backup services. So, if you are at IBM Think this week, think about how IBM and Veeam are Better Together for the data that drives your business. Come see us and let’s talk about how IBM and Veeam can protect your valuable data assets wherever it is today and where it will be tomorrow.